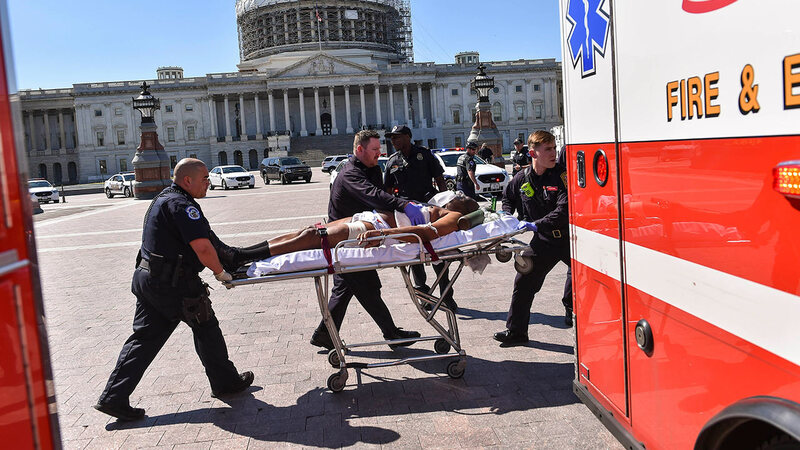 WASHINGTON -- Police shot a man on Monday after he pulled a weapon at a U.S. Capitol checkpoint as spring tourists thronged Washington, authorities said. The suspect was previously known to police. That man, 66-year-old Larry Dawson of Tennessee, was issued a "stay away order" by D.C. Superior Court in October, telling him to keep away from the Capitol grounds, court documents show. In a statement late Monday thanking police for their work, Rep. John Larson, D-Conn., said Dawson pulled a gun at the U.S. Capitol Visitor Center and police responded once he drew his weapon. The police chief said the suspect was undergoing surgery but provided no information on his condition. Later Monday, a spokeswoman for MedStar Washington Hospital Center said a person involved in the incident was taken to that hospital and is currently in critical condition. She would not identify the person or give any additional information.